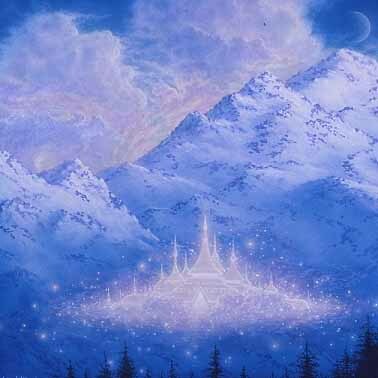 On January 7th, Walking Terra Christa started their classes with information on the Crystalline Flame within the Golden City of Shashwam (also known as Klehma). This city resides in the 5th dimensional Earth over Kansas, Nebraska, Colorado, and Oklahoma in the United States. As of January 1st 2015 the Earth is now integrated with this ray of light. We are working with the Crystalline energies in the next few weeks to help understand what this ray represents to each of us. This class was an introductory lesson for the Crystalline Flame as it is now being grounded within the core essence of GAIA’s crystalline structure. We were guided by Master Serapis Bey along with the Elders, the Elohim Masters, and Archangels for an amazing visit. The overlighting energies of this city represent Balance, Harmony, and Peace for Mother Earth and humanity. Serapis Bey is the overseeing ascended master representing the Ray of Balance and Harmony through Conflict. We can see that the higher frequency of this ray is being shown in this beautiful 5th dimensional city as it no longer represents the conflict but Peace for each of us and within the New Earth. The aspects that are emphasized within the city are Purity, Equilibrium, Compassion, Physical Courage, Generosity, Artistic Development, Unselfishness, Mental and Moral Balance, along with Confidence and Serenity. The Cosmic Ray of this City is reflected in the Pure Crystalline frequencies and will reflect through the entire city. Resurrection along with Hope of a better tomorrow is reflected within all elements. This will be the city for artists and musicians along with cooperation within cultures. It is a city of many races even more so than the others because it is perfect place to arrive when one needs to interact with many levels of Beings, many cultures of inter-planetary lives. It truly is a City of Courage. We utilized a decree that is written for one of our programs, 22 Rays of God. As it comes within my Root Chakra representing the Resurrection of My Being. That will be represented upon the New Earth of Terra Christa. As it molds you into the Divine Being You Are. To prepare you for the Moment of your Rebirth. To prepare for the next phase of my journey. With outstretched Arms of Light. To be replaced by the Purity and Light That They Are. Blend within the frequency of perfection that You Are. In Waves of Beauty that I AM. It is now continuing and spinning me in many directions. He shows me the greatest Joy that I could ever imagine. But all the parts that have made you in this form. And upon the strength of the Earth. To completely blend within me. This entry was posted in Channeling, Golden Cities of New Earth and tagged 5th Dimension, 8th Ray of Higher Cleansing, Ascended Masters, Ascension, balance, channeling, conflict, Cosmic Ray, Cosmic Rays, Crystalline Rays, God Force, Golden Cities, Golden Era, harmony, Klehma, Lightworkers, Lord Adama, love, Master Serapis Bey, meditation, Mother Earth, New Earth, Oneness, peace, purity, Ray #4 Harmony & Balance, Rays of God, Serapis Bey, Shashwam, Walking Terra Christa. Bookmark the permalink.